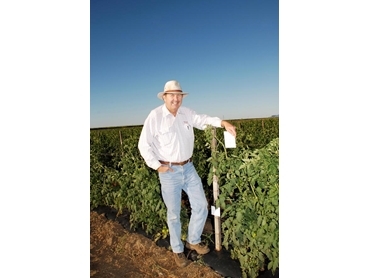 Success NEO, an insecticide from Dow AgroSciences Australia is showing remarkable results against new pest challenges in tomato crops in the North Queensland region. The removal of selected broad spectrum chemicals from the market has dramatically changed the pest spectrum for North Queensland tomato growers as secondary pests such as thrip and green vegetable bug are becoming harder to manage, according to Dale Abbott from Bowen Crop Monitoring Services. Dale consults in the Bowen and Burdekin region of the dry tropics, offering a range of services from crop monitoring and crop nutrition through to quality assurance and R&D. With 30 years in the business, he believes the negative impact of withdrawing certain insecticides far outweighs the benefits. Though thrip has always been endemic in this region, it was considered a secondary pest previously as it could be easily managed using the chemical insecticides. Their unavailability is leaving growers with a limited choice of insecticides, which have a narrow pest spectrum. Success NEO is the one product that can be used by tomato growers to control Heliothis, a primary pest, and thrip, a former secondary pest, while still remaining relatively soft on beneficials, giving this insecticide a major advantage over other available insecticides. Offering a relatively wide chewing pest control spectrum, Success NEO is suitable for a range of crops from bananas to brassica vegetables, cucurbits, leafy, legume and root and tuber vegetables, stem and stalk vegetables as well as culinary herbs. In fruiting vegetable crops such as tomatoes, it protects against potato tuber moth, Heliothis and western flower thrip. Containing the active ingredient spinetoram, Success NEO offers improved photo-stability to protect against fast breakdown in sunlight, ensuring longer efficacy. This characteristic does not affect the withholding period of one day for celery and tomatoes, and three days for most other fruits and vegetables. According to Dale, the region’s fruit and vegetable growers face new pest challenges each year with a changing pest spectrum and a gradual reduction in pesticide options. He singles out the silver leaf whitefly as a key challenge this year as it spreads the tomato yellow leaf curl virus. He explains that the main cultural method to manage the virus is to plant resistant varieties, combined with good field management techniques. The Eretmocerushyati, a parasitic wasp specific for silver leaf whitefly eggs is also being released into the tomato crops. The growers hope to combine these methods with specific insecticides such as Success NEO as part of an integrated pest management system to reduce the virus incidence.